We have a slight challenge in our apartment because we have great looking steel casement windows that don't play nicely with air conditioners. Sure you can mount one in the window, but that's permanent and it requires you to cut out part of the steel window frame. 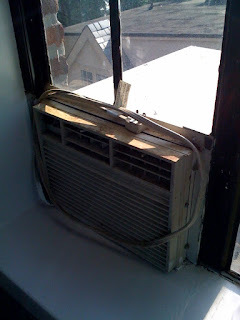 As you can see below it's unsightly and you're stuck with that air conditioner. It's on our list to get this removed and the window repaired. A few people I know have opted for portable air conditioners aka the rolling units with the clothes dryer-looking hose coming out of them. Those seem to work well except for the fact that you still need to vent them. The kit provided is designed for other types of windows. 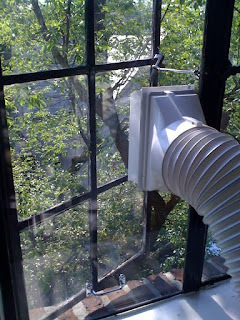 Some people have solved for it by taking a pane of glass out for the vent, another destructive solution. What I opted for was to fabricate a Plexiglas insert that would seal the room, provide light and not destroy anything. The Plexiglas fit's snugly and the window which is held close with the eyelet actually presses against the Plexiglas holding it tightly in place. The only additional hardware I needed to add is a few latches to further secure the Plexiglas. Clearly this isn't a secure solution for a ground floor window or a window accessible from a fire escape or ladder. We're running a Sharp CV-P10MX and so far it's doing a great job of cooling the room. We'll have to see how well it does in the 90+ days. There is also the question of whether we'll need to drain the condensate tub or is it truly drain-less. The other interesting fact is that there are no Energy Star ratings for portable units. UPDATE: For more detailed pictures on how the casement window insert works visit my other blog post by clicking here.